I read carefully below & will make my own liquid. 79 points can be awarded to your webstore account (see FAQ). for improved value and performance vs. the Spin-Clean™, Studebaker™ & Vinyl Style™ Record Washer systems. 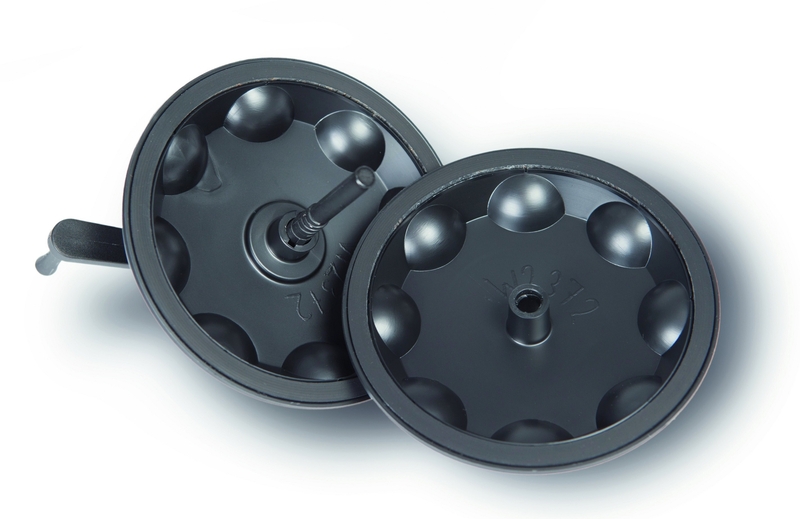 Wash housing with brushes made of goat hair to gently yet effectively reach down deep. !!! New !!! 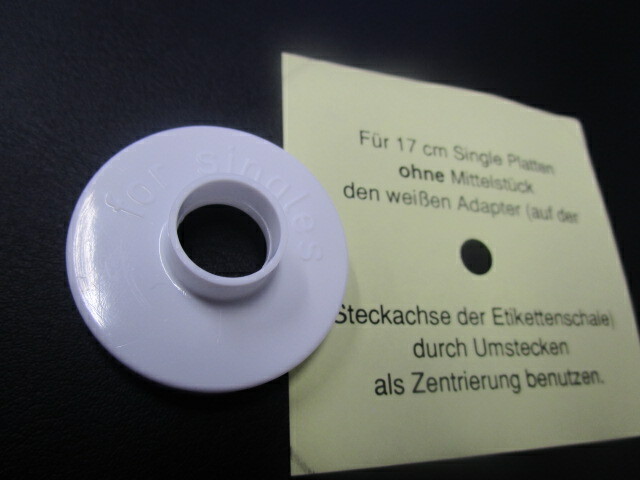 Label seal cup with rubber O-ring seal built in. !!! New !!! Hand crank for LPs(12 inch), singles (7 inch) and 78RPM (10 inch). !!! New !!! The brushes CAN now be swapped out. But since they are natural goat hair it is unlikely to be needed. Same great performing funnel and filter with which the liquid is filtered in the bottle after use. 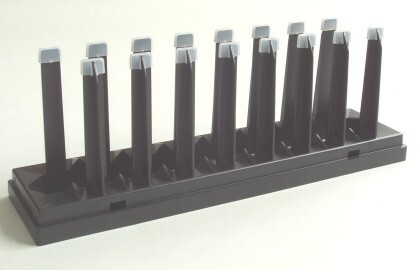 Same great performing drying rack with drip tray for 15 records. Stores neatly under main tank housing after use. SHIPPING: Int'l orders outside the USA, you must select "US Priority Mail Int'l MEDIUM BOX" during checkout. This is a DIY formula kit. Why pay $30 for a quart of extra fluid from the other guys? Here is a typical ingredient list you can mix for a proven effective formula. See write-up below for links to more solutions. If you are not sure that a commonly sold hand brush will do the job and don't want to jump up to a $500 or $2000 vacuum cleaning machine then this solution deserves strong consideration. 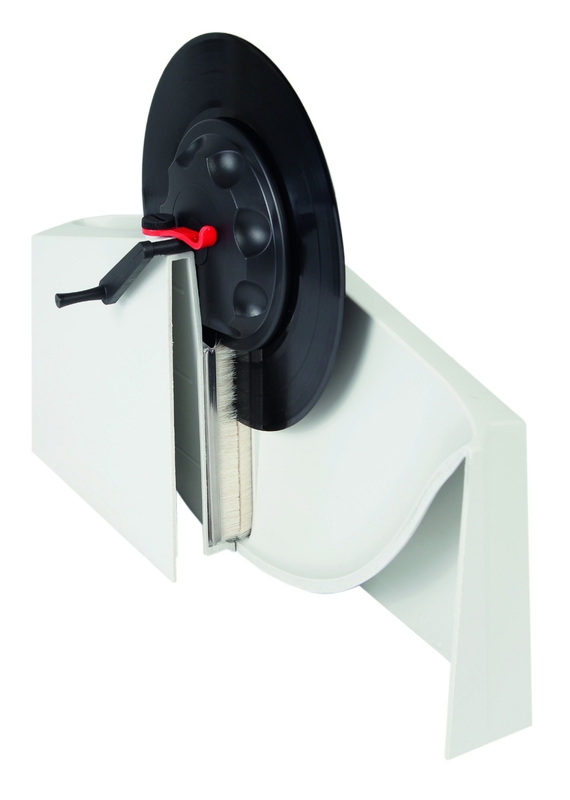 The Disco-Antistat Record Washing System is made in Germany. Due to import hassles, we chose not import the cleaning formula! We love providing innovative solutions so let's not risk an alcohol spill at the post office and at the same time save you $20-$65 [at press time] compared to the Spin-Clean Record Washer product by mixing your own solution. Only 4oz or 36oz of solution are included with the other guys. Then another $9.99 for each additional 8oz. OR you can mix your own solution by reading this >>>> Record Cleaning Devices and Fluids <<<< article. With a trip to your local hardware store you can mix your own expert-sourced solution for far less. We include free Priority Mail in USA only. We removed the cleaning solution (see above). 78rpm (non-vinyl) shellac or lacquer records require alcohol-free cleaning fluid. For shellac or lacquer, alcohol = instant death. 78s can be cleaned with a few drops of plain (no additives) Ivory or Ajax dish liquid with distilled water. Rotate the records both clock and counter-clockwise. This prevents the hairs from potentially becoming matted down. (we have not observed this occur in our limited use.) Some have observed the foam in the felt pad of the other guys will collapse or compress. Unlike the other guys, the bottom of the basin is free of nooks n crannies to provide trouble-free cleanup. The factory set gap between the brushes is proper for normal record thickness. It will be more difficult to rotate a 180 gram record. Unlike the other guys, this kit does not have drying cloths because alcohol based solutions with a drying rack can air dry. This avoids possibly re-introducing cloth particulates back on the record. Kit is probably not dishwasher safe! For a more detailed write-up on the subject of cleaning records we found >>>THIS PAGE<<< to be very good. Use the Disco-Ansistat Generation II kit in a very well ventilated area. Use only distilled or reverse osmosis water in your solution and for rinsing off the kit when done. Not "demineralized" water. If you got this far, watch the video above before purchase. It works well and as designed. However, the center clamp is not large enough fully protect the labels. It should have an additional 0.25 - 0.5 inch diameter in order to fully cover then label. This is the first record cleaner that I've purchased. I've been spinning vinyl since the 1950's. We knew nothing about cleaning at that time. I purchased a D4 kit in the late 70's and used that on every LP before playing. This system is so far advanced past that. The first LP that I cleaned with this system sounded so much better, I was sold and will never go without my Disco cleaner. My Lp's from the 70's sound as if they were just pressed. Buy it, you will not regret buying it!! The Disco-Antistat is an excellent Value. It securely hold the album up, and out of the way from any cleaning fluid while cleaning. Allowing for proper cleaning of your albums. With a well thought, yet simple, covering to protect the labels from washing and residue. Personally, I bought two of them. One to be used as a cleaning reservoir, and the other for rinsing. Which, compared to all of the hi priced cleaning systems available, was still a great value. Just like the name implies, it helps to remove built up static electricity in the vinyl. Without introducing any more unwanted static buildup during the cleaning process. That a good portion of the Hi-end vacuum machines are notorious for introducing. Its simple, easy to use, and does a great job. This really works as advertised. I have a lot of 40 yr old vinyl from my youth which was never well taken care of, plus some newer vinyl. The machine works well and easily to remove all the gunk. The drying rack is very handy. I use 3 parts distilled water and 1 part isopropyl, with two drops of dish liquid per quart of fluid. There are quite a few recipes out there for cleaning fluid, so there's nothing magical about which one to choose as long as you heed warnings if you're cleaning antique albums. The Disco washer system worked much better than microfiber cleaning cloths, which I tried first as an attempt to save money. The cost of this unit is the reason for only 4 stars, as it really isn't a complex unit. But there aren't many alternatives, and none of them work as well as this one. Ultimately I am satisfied with the purchase and happy with how well it works. Found a good used record store just a few miles away. The Disco-Antistat does a great job with just distilled water and a mild surfactant (no alcohol, thank you)on the old LPs and it is surprising how well many of my new "used" purchases play in spite of careless handling by previous owners. I have been resurrecting my decades long neglected collection, but hey, at least I was using rice paper and outer sleeves for them! Anyways I was introduced to the concept of a bath cleaner by a friend and picked up this model. It works wonders. Oh, don't freak out, the record holding base is nested in the bottom of the big piece (I didn't notice until I looked at the instructions). The cleaner recipe as linked and included recipe printout works fine. Distilled water from supermarket, Methanol from Home Depot/whereever, Isopropyl 90% from pharmacy/chemist and scentless (Free and Clear) detergent from wherever (you should use that stuff anyways). I made a big batch and have it in a plastic 2 gallon container. After a cleaning session I strain the used solution and put it in a separate container for reuse as it gets noticeably dirty. I will use one batch of solution twice for maybe 24+ records or so, depending on conditions, then dump it. I also suggest settling on one direction of rotation when cleaning, I used a sharpie to mark a clockwise arrow on one side to remind me. This lets me know what side the crap will accumulate (hairs, etc). There is no included cleaning brush when it comes time to clean the bristles. I just take it to the sink and spray it down to get the detritus out. Used with care, following instructions, this cleaning system works very well. 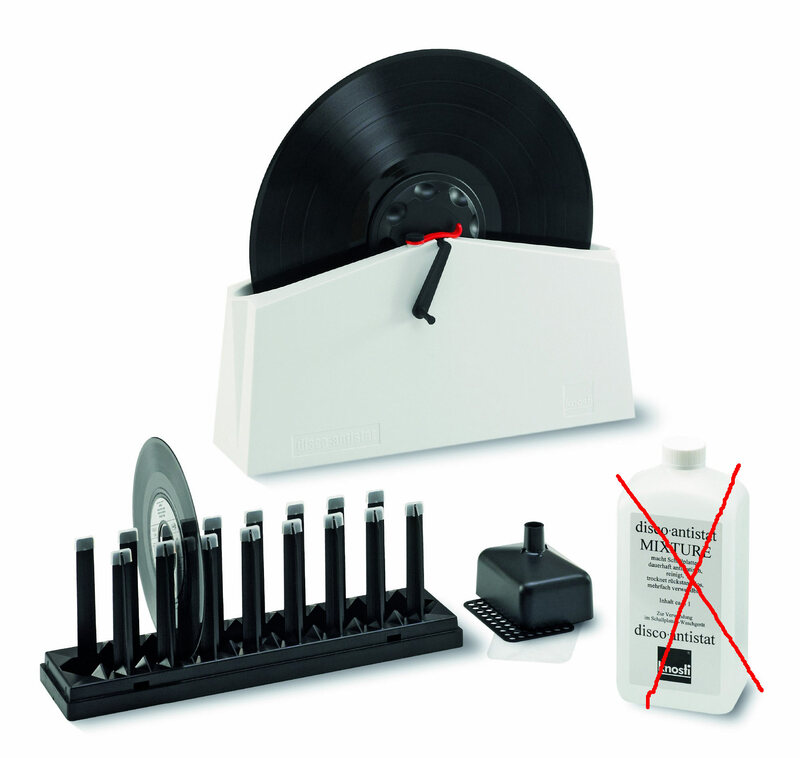 It removes the dust and static from even very dirty records without much trouble. It is wise to place cleaned records into new antistatic sleeves, so they will stay clean and not charge up again. The real key to this system is the industrial-strength fluid and goat hair brushes. Be patient at first with the rubber rings. It is easy for them to fall out or keep the caps from fully tightening. With care, the whole mechanism will thread together correctly and fit properly in the tank. Once you do a batch of records, it will all work smoothly. What's to say? It works. I wasn't totally sure what to expect or how well it would work because a lot of my records are used and not especially clean when I get them. I have to say that this system did an amazing job of cleaning some very strange gunk off of a number of records. Just be warned that this can get a little messy when you're pouring the fluid into the system and (if you recycle it) back into your container. The included funnel helps, but you need to be careful. I mixed up the fluid in a plastic milk jug which works very well for storage. Excellent product for maintaining a medium to large size record collection. The Antistatic is well made and simple to use. The brushes are not too aggressive and they cover the entire playing area of the record. The only variable is the composition of the cleaning medium one chooses to use. I have had great results with the overall effectiveness of this product used in conjunction with my Record Doctor vacuum. Simple and effective. Very happy with this unit it does clean without any residue left on my stylus. I only use it as a rinse 90% distilled water 10% isopropyl and 15 drops of photoflo per quart.Clean first with whatever mixture you use by hand then use the Knosti to rinse with this formula let air dry for 1 hour the play or put in antistatic sleeve. This machine literally transformed my static records into new sounding discs. No joke, used Monks formula and rinsed well also and let dry for hours, no cloth at all and I'm only on the second LP side and the music is just staggering. Only wish I would have done this much sooner!